The first International Symposium on 3D Power Electronics and Manufacturing was a true success! 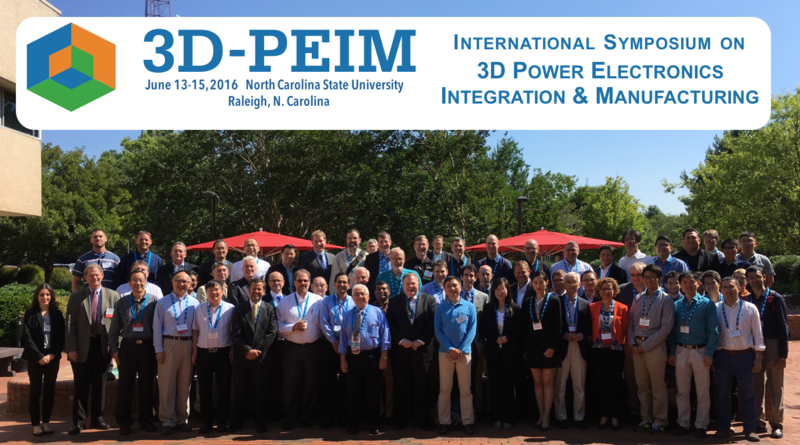 On June 13-15, 2016, over 80 participants, 11 from outside the US, attended the 1st International Symposium on 3D Power Electronics Integration and Manufacturing (3D-PEIM) in Raleigh, North Carolina. The symposium offered 39 presentations in 11 sessions, and began with three tutorials that focused on “The World of Packaging Technologies and Critical Issues” taught by Professors Douglas Hopkins, Guo-Quan Lu, and Patrick McCluskey. A highlight was the Plenary Road Mapping session chaired by Brian Narveson, PSMA, with keynote speeches from Chuck Richardson, iNEMI on “2017 iNEMI Roadmap Process and a Preview of Selected IoT/Wearables, Packaging & Board Assembly Chapter Highlights”, Bram Ferreira, Technical University of Delft on “International Technology Roadmap for Wide Band-gap Power Semiconductors”, and Bill Chen, ASE-US and IEEE CPMT, on “Heterogeneous Integration for IoT, Cloud and Smart Things”. The presentations from the Symposium are available to PSMA members in the Members Only section of the PSMA website. The Symposium was organized by the Power Sources Manufacturers Association (www.psma.com), chaired by Prof. Doug Hopkins of North Carolina State University, and supported by 15 exhibitors and sponsors, including the FREEDM Systems Center at NCSU, CPES at Virginia Tech, and CALCE at University of Maryland. Of special note: SARDA Inc. selected the 3D-PEIM Symposium to announce its collaboration with UTAC and AT&S to implement its Heterogeneous Integrated Power Stage (HIPS). All three were exhibitors and/or presenters. Plans are now underway for 3D-PEIM 2018 and organizers and sponsors are being solicited. If you are interested, please contactinfo@3D-PEIM.Org, or the PSMA office at power@psma.com.